John Patrick Shanley digs deep into his past and creates a brilliant portrait of the artist as young rebel seeking his identity at an exclusive prep school. Based on autobiographical experiences and directed by the author, Prodigal Son describes the two years from 1965 to 1967 when the young Shanley, a tough kid from a working class neighborhood in the Bronx, having been thrown out of Cardinal Spellman High School at the end of his sophomore year, received a scholarship to the tony Thomas More Preparatory School in old world New Hampshire. Arriving on campus, he found himself in an intellectual Eden but also a fish out of water. “It was a special, beautiful room in hell,” he tells us. We see him with three of his teachers: Alan Hoffman, head of the English Department, a bachelor who every year makes a project of one of the students, and who sees great things in Jim; Carl Schmitt, the headmaster, an idealist and devout Catholic who wants to forward Jim’s chances but not at the expense of the rules or his own religious beliefs, and his wife Louise, with whom Jim takes a year-long English tutorial in “The Wasteland,” compassionate and understanding, who admires Jim’s poetry and attempts to open his mind to new ideas. We also see him in his thorny relationship with his traditional roommate Austin, nephew of the headmaster, a math nerd, who also has trouble finding a girlfriend but while Austin is still afraid of women, Jim finds they don’t come up to his high standards. Up until almost the end, the tension of this long one act is purely intellectual as Jim challenges everyone’s beliefs as well as the school’s rules. Then as we approach the end of his two years at Thomas More, there is the pressing question of whether Jim will graduate having been implicated in one too many infractions. Shanley overloads the ending with too many revelations on the part of the faculty, secrets which have not been properly foreshadowed. Nevertheless, the play is always engrossing and the portrait of Jim Quinn (as he tells us in a program note, drawn from life) is fully three dimensional: a young man seeking to be Hemingway and Jack Kerouac rolled into one but with much more intellectual heft. 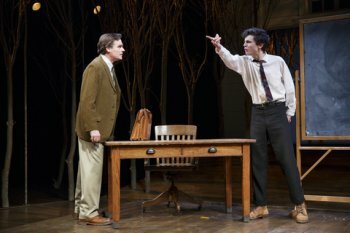 Television and film actor Timothée Chalamet (Showtime’s Homeland and Christopher Nolan’s Interstellar) makes an impressive New York stage debut as the play’s young protagonist. The role is almost too small to contain his bigger-than-life portrayal: kinetic, animated, provoking, questioning, vital, dynamic. His moods turn on a dime and he can shift from being a sophisticated adult back to being a little boy in a moment. Tall and lanky, he suggests the author but as he must have looked back in 1965. Also making his Manhattan Theatre Club debut, David Potters as his roommate Austin is tremendously sympathetic as a young man afraid of breaking the rules who has led a very sheltered life up until now. The adult actors are well cast though their roles are not quite as interesting. Tony winner Robert Sean Leonard (as poet A.E. Housman in Stoppard’s The Invention of Love) is much more subtle and ambiguous than usual as the English teacher who is impressed by Jim’s mind and spirit. Chris McGarry, who has appeared in many Shanley plays including Doubt on tour and the MTC productions of Defiance and Where’s My Money?, gives a layered performance as the conflicted headmaster who has demons of his own. Dispensing tea and sympathy as well as intellectual stimulation, Annika Boras gives a very beautifully modulated performance as the headmaster’s wife with contentious opinions of her own. A good deal of the success of the production is due to Santo Loquasto’s atmospheric setting. Before a dream-like vision of an old mansion which houses the school, surrounded by birch trees in winter, various sets of classrooms, a dorm room, and faculty housing slide into place. Jennifer von Mayrhauser’s costumes always suggest the divide between Jim and the life to which he is being introduced. The lighting by Natasha Katz alternates between the warm and cozy and the wintry feel of deep New Hampshire. The melancholy music with its guitar strains is the work of 1960’s icon Paul Simon. Prodigal Son is a memory play of darkest adolescence told with tremendous authority and the shock of recognition. It may just be John Patrick Shanley’s best play in years. Its portrait of a youth extravagantly wasteful of his talents as he waits to understand what people see in him is one that we all can identify with even if we have not attended a prep school. Also see the play for the remarkable debut of Timothée Chalamet from whom much more should be seen in the future. A modern romantic comedy that just barely avoids sitcom clichés. Playwright Lindsey Ferrentino’s latest is a well-intentioned disappointment. Janet McTeer plays Petruchio as a swaggering cowboy in a leather jacket and shabby jeans, so macho that her character seems to be in on the joke.